Coming home after a work trip, it’s hard to get back into the regular routines. I find myself gravitating toward wanting to continue the cycle of eating out and having someone else clean up after me. One thing I never miss when traveling is the traveler’s breakfast. The goal when traveling for work is to nourish thyself and then get going to whatever meeting, event, conference or meet-up has brought me to that fine city. Working warrior breakfasts are all about efficiency and not really about lingering. Save that kind of breakfast to leisurely loll about at a destination brunch restaurant on a personal trip. Breakfast on the go while working can be particularly dicey. Have you ever tried a “complimentary breakfast” at a hotel? I can help you out here. You will find the usual suspects of cereal flakes slick and shiny from sweetener peeking out from clear plastic tubes from which they slide so easily into bowls. Next up, the toaster and his consortium of friends: sliced white bread, bagels and the ever-present danish or pastry that never saw anything close to Danish relations. Near them, you will find small packets of peanut butter, cream cheese, butter and jelly which don’t taste like anything found in nature. If you’re lucky, there might be a big bowl of fruit like cubed pineapple and honeydew with strawberries, grapes and watermelon hovering in a liquid colored the sum of its parts. In winter. “Hey now,” you say, “surely there is yogurt available.” Why yes, small tubs of “raspberry” and “peach” yogurts jut out from their icy hovels mocking me with possibly the same amount of sugar as the pastry. And I can’t forget the receptacles of waffle batter posted right next to the piping hot waffle irons. None of this really works for me. I would rather indulge in a swirl of frozen yogurt or a few squares of chocolate later in the day to entice my sweet tooth finding sugar where expected. The chump of all chumps though, in that continental breakfast- the one that makes me want to wag my finger in defiance is none other than the cartons of quick oats. You know the ones- tubby little containers filled with rolled oats, freeze-dried fruit bits and sugar. They get me riled up as they put on airs about being healthy when I would posit that a hard boiled egg could run circles around these impostors. A girl can dream… of a breakfast bar loaded with carafes of chilled kefir, bowls of plain yogurt and preserved fruit next to a mise en place of toasted walnuts and dried fruit. A pot full of steel-cut oats would be nearby with a toothsome quality and near small bowls of flax seed, chia and hemp for added texture and crunch. For the crunchy cereal lovers, fresh batches of granola would be cooked up and there might even be homemade scones for those that want to indulge, except the scones would be made of whole grain flour and studded with ginger. In my hotel breakfast bar, there would be egg options always available and cold-pressed juices with specific recipes tackling specific intent. If we’re going to reach for the stars, the hotel buffet would also boast a good tea selection, not just English Breakfast and Chamomile. Coming back to earth now, I fully understand that this ideal would be cost-prohibitive with costs being turned over to guests making it a hotel I wouldn’t be able to afford. So, what is a girl to do? Pack her own Good Morning in the guise of Muesli. I mulled over this recipe having returned from a recent tradeshow where I did the unthinkable the first two mornings and unintentionally skipped breakfast after surveying the breakfast bar. The third morning I assailed the breakfast bar with the ferocity of two mornings and all the grazing that followed. I knew better but found myself disheartened by the options. One morning I even had hummus for breakfast with pretzels- not a breakfast of champions. Fresh on the heels of returning from the show, I decided to take matters into my own hands, and mixed up my own Muesli. As I considered ingredients, I wanted it to be hearty and oats stay with you. I sought to fruit-sweeten it with fiber-full dried fruits and reached for my cherished figs. Then, because I know I usually crave protein in the morning, knew it needed some walnuts and sunflower seeds. Lastly, the cinnamon and ginger would highlight the rest of the ingredients playing up the sweetness of the sultanas and currants. I had jarred a winner. Continental breakfasts say nothing about the continents to me or for that matter continence. Instead, they seem like a cheap response to marking a hotel room up because there appears to be added benefit. So, next time you are booking your travel arrangements, don’t fall for the free breakfast promotion- opt to bring your own and waggle for free WiFi. If you are planning to eat the Muesli at work, you are in luck. The large wide mouth variety of Mason jars holds about a work week’s worth of muesli inside. Take it with you on a Monday and you should be set for homemade breakfast through Friday. Then again, if traveling, pack several servings of it in a small mason jar to tuck into your carry-on. It won’t take up that much room, plus it will be a welcome reminder of home and the goodness of homemade food. 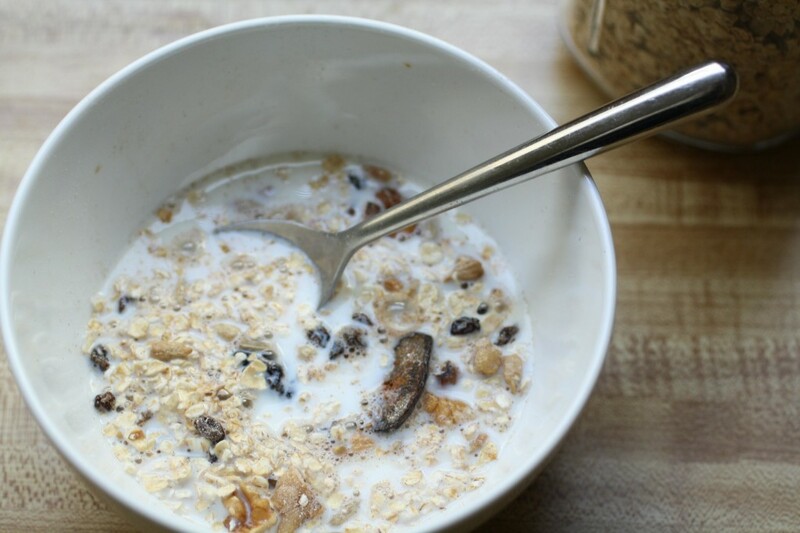 When serving the muesli, I like to use around 1/2 cup of milk- cow’s, almond or hemp. If you prefer sweeter muesli, add a drizzle of maple syrup. 1. Pour rolled oats into a large bowl. Then toss in the dried currants, sultanas, and sunflower seeds. Set aside. 2. Quarter the walnuts. Lop off the stems from the dried figs and cut the figs into halves. Toss the chopped walnuts and figs into the big bowl. Add the cinnamon and ginger. Stir all ingredients until coated and well combined. 3. 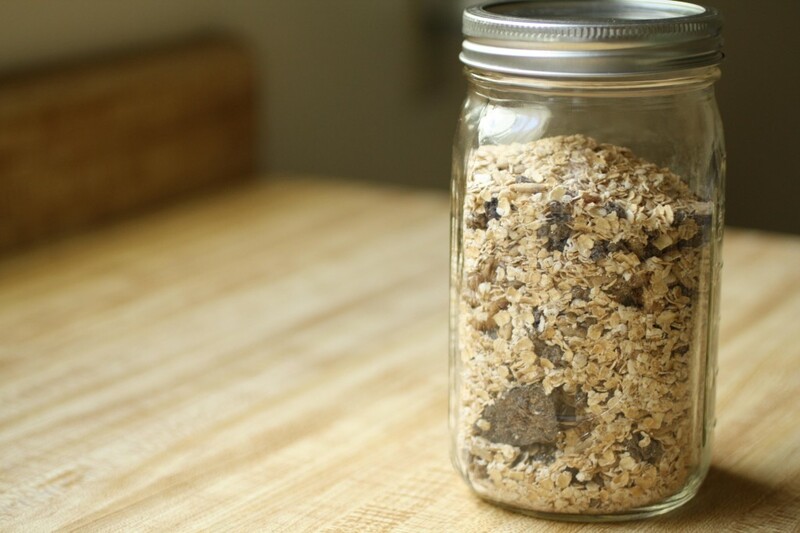 Scoop your muesli into a large wide mouthed mason jar.